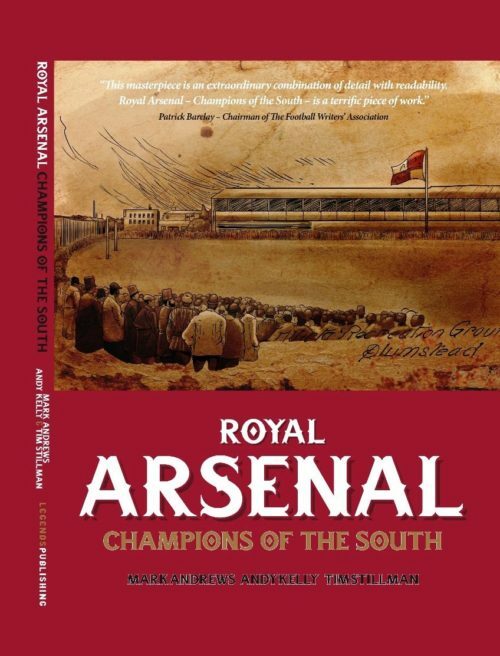 I would be hard pushed to think of a conversation I’ve had with Mark and Andy about The Arsenal where I didn’t learn something new about the history of our great club, so I was both thrilled and honoured when they asked me to write a review of Royal Arsenal – Champions of the South, especially as I’ve always had a huge interest in the history of the club. Also, knowing Andy and Mark personally, I know just how passionate they are for what they do. Along with Tim Stillman, who is an incredibly talented writer and, in my opinion is the best Arsenal blogger out there, an accolade I don’t bestow lightly given the wealth of talent that exists in that sphere, they have managed to produce a genuinely fascinating and immersive piece of work that’s jam packed with historical facts, as well as retaining a readability that can often be lost in a book of its kind. Beginning with the birth of The Arsenal and how Royal Arsenal emerged from the Dial Square Cricket Club during a “smoking concert” (essentially the Victorian equivalent of a lads night out) at the Prince of Wales public house, Plumstead Common in October 1886, as well as confirmation and location of the clubs first official game, and the truth behind the Nottingham Forest connection regarding the kit. Other highlights include a 10-1 thrashing of Tottenham Hotspur on September 21st 1889, a defeat that scarred that lot so much they wouldn’t face The Arsenal for another seven years, the clubs first ever FA Cup tie – an 11-0 walloping handed out to Lyndhurst, the first ever trophy the first team lifted – the Kent Senior Cup – the list goes on, and there are slices of the history of this great club we have all come to know and love on every single page. We’re not just talking mere trivia here either, as Tim alludes to in his foreword – there is information contained here that Arsenal Football Club themselves are unaware of! There were also a couple of things early on in the book that I found rather amusing when looking at them from a “modern” point of view, in particular the first ever full match report of an Arsenal game, a 6-1 win against Erith – a real “imagine if Twitter were around when….” moment. Let’s just say that if it were, then Bernard Beard’s timeline would have been bombarded by dozens of angry Arsenal supporters no doubt labelling him an “absolute bounder” or whatever the go to insult was back in 1887. I’ve deliberately kept this review as short as possible, as everything you’ll learn from this book will be a lot more enjoyable to discover yourself. This review by Darren has appeared in Gunnerstown recently.